BelarusDigest > All > Political Prisoners – No Longer a Sticking Point in Belarus-EU Relations? This May, the Belarusian authorities increased pressure on a number of political prisoners, including former presidential candidate Mikalaj Statkievič, anarchist Mikalaj Dziadok and political activist Jury Rubcoŭ. This move appears unreasonable when set against a backdrop of improving relations with the West, as the political prisoners issue has always been a major contributing factor in western policy towards Belarus. However, in recent months, an unheard of number of Western officials have visited Minsk, and few, if any, raised much of an alarm about the human rights situation. The reason for their conduct is, clearly, a result of the regions' profoundly changed geopolitical landscape. The growing concerns surrounding the Ukraine conflict and Belarus' position on Crimea's annexation and peacemaking efforts are pushing the West to change their strategy towards Minsk. Isolation is giving way to strengthening Belarusian independence in order to weaken Russian influence in the region. Still, western negotiators should be careful not to remove human rights issues from the agenda, while acknowledging that talking to Minsk requires some delicacy. On 5 May the court of the Škloŭ colony ordered Mikalaj Statkievič to be transfer into a prison for the rest of his time in confinement for breaking the terms of his imprisonment. 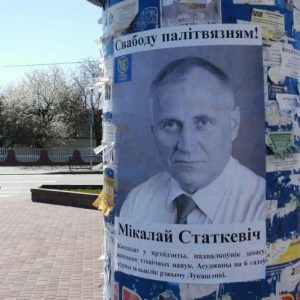 Mikalaj Statkievič, a famous Belarusian politician, is serving a six-year term in prison for leading the 2010 street protests that opposed the results of the presidential election. He is the only former presidential candidate still in prison, and continuously refuses to sign an appeal for a pardon to Lukashenka, an position that seriously irritates the authorities. On 20 May, another political prisoner, Mikalaj Dziadok deliberately injured himself protesting against harsh conditions in the penal ward. However, after receiving medical aid he was sent back to the ward. Mikalaj was one of the anarchists imprisoned by the authorities for allegedly attacking state buildings and private institutions in 2011. On 28 May, the Pružany district court sentenced Jury Rubcoŭ to two years in prison for evading compulsory work, which he was originally sentenced to serve out in an probationary correctional facility. Rubcoŭ found the wages for jobs the administration assigned him to be too low and demanded the average Belarusian salary. He was serving a 1.5 year term for insulting a judge during an administrative trial after a Čarnobyl Way annual protest gathering. Currently, Belarusian human rights groups, the International Federation for Human Rights and Freedom House list six political prisoners in Belarus. Four of them, Ihar Alinievič, Jaŭhien Vaśkovič, Mikalaj Dziadok, Arciom Prakapenka, were tried in 2011 under the so-called “anarchist trial” and sentenced to 4.5-8 years in prison. They are accused of attacking banks and casinos, as well as a KGB office in Babrujsk. As for the cases of Jaŭhien Vaśkovič and Arciom Prakapenka, Belarusian human rights groups accept that certain laws were broken, but say their prison terms are excessive. However, earlier this spring the head of Latvian Foreign Ministry Andrejs Pildegovičs stated that the EU officially only recognises three political prisoners: Ihar Alinievič, Mikalaj Dziadok, and Mikalaj Statkievič. In other words, the EU apparently accept, more or less, the validity of the the charges against the remaining three anarchists as well as Jury Rubcoŭ. Moreover, authoritative international groups Amnesty International recognised only Mikalaj Statkievič and Jury Rubcoŭ as "prisoners of conscience". Meanwhile, Minsk continues to insist that there are no political prisoners in Belarus, and those whom human rights groups call political prisoners are serving fair sentences for specific criminal offences. Political prisoners are now a part of the Belarusian electoral cycle, with each of the two last presidential campaigns in 2006 and 2010, as each were accompanied by the imprisonment of activists and opposition figures. By doing so, they demonstrate their control over what is considered politically acceptable in Belarus. At the same time, political prisoners have been the chief obstacle in developing relations with the West, which thus far have set a proper human rights record as a necessary pre-condition of any improvement of relations. As Polish Foreign Minister Radoslaw Sikorski stated at a EU foreign ministers meeting in 2011, "the liberation and rehabilitation — their participation in politics — of all political prisoners in Belarus is a prerequisite for our resumption of dialogue with authorities in Belarus". Consequently, Lukashenka sought to find a balance between demonstrating his firm grip on the domestic situation, all while maintaining some degree of cooperation with the West. The image of a dictator holding people in prison for political reasons, in Belarus' case, continues to damage the investment attractiveness. It damages any real potential economic cooperation with western countries, to say nothing of securing loans from international financial institutions like the IMF. Moreover, Lukashenka is now in dire need of a counterbalancing force to overwhelming Russian influence in Belarus if he is to retain his ability to independently make decisions. Although he tries to find it elsewhere in the world, Europe and the US certainly remain major actors in the game. Lukashenka sees bowing to demands to release the prisoners, sees as humiliation. Perhaps he hopes that the growing security threats in the region may help him build relations with the West without releasing political prisoners. Hostages of the Ukraine Crisis? In recent months, Minsk has hosted unusually large number of western officials, including the Deputy Secretary General of the European External Action Service Helga Schmid, Commissioner for European Neighbourhood Policy and Enlargement Negotiations Johannes Hahn, PACE special rapporteur on Belarus Andrea Rigoni, and US Department of State representative Eric Rubin. In their meetings with Lukashenka and other Belarusian senior officials, they have largely discussed Ukraine and appear to have shelved any serious discussion on human rights issues in Belarus. Minsk's peacemaking efforts in the Ukraine conflict and its refusal to support Crimea's annexation, by all apperances, have proven to be of greater importance to the West. As Eric Rubin stated, “In our view, support for Belarusian independence, economic growth and trade do not contradict the issues where we have disagreements”. This new approach allows for limited cooperation in a de-politicised manner that seek to strengthen Belarus' independence and, consequently, weaken Russia's influence on its neighbours. While the West does still recognise the political prisoner problem in Belarus, it has assigned it to the competency of a sovereign state to deal with. This limited cooperation suits Minsk well. It has no interest in adopting European political models and norms, and can benefit from other forms of cooperation with the West, especially those that can nudge Russia towards new concessions with energy and loans. By taking the political prisoner issue of their foreign affairs agendas, even temporarily, is precisely what Minsk has been yearning for for years. While it may make cooperation between the West and Belarus easier and could potentially lead to deeper engagement between them, the issue of political prisoners should not be set aside. This requires a delicate balance of diplomacy and determination by western officials in their dealings with Minsk. As Lukashenka tries to improve ties with his Western counterparts, questions arise as to the merits of this thaw in relations for both parties. Despite the conciliatory tone of US and EU officials, their representatives at the UN Human Rights Council maintain a tougher stance towards Minsk. 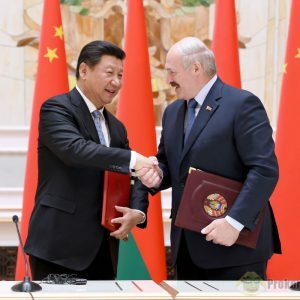 While the West may be vacillating on how to best cooperate with Lukashenka, the Chinese President's recent visit to Minsk demonstrates that Belarus' global standing may indeed be improving. Agreements signed with China promise to bring much needed investment and loans. Still, the imprisonment of Belarusian citizen for an anti-Lukashenka tattoo and a new law which will fine people for not working shows that little has changed in Belarus as the presidential election approaches. All of this and more in this edition of the Western Press Digest. Weary of Russia – The Guardian reports that Russia's involvement in the Ukrainian conflict and the annexation of Crimea has raised concerns amongst the authorities and opposition alike. Whereas Lukashenka use to speak fondly of the brotherly nature of Belarusian-Russian ties, his reserved tone and caution is not only being restricted to speeches, but is also find its way in state-controlled organisations. One such organisation is a think tank that is now monitoring what imperially-minded Russian authorities and thinkers say about Belarus. Lukashenka's rhretoric on preparing Belarus to defend itself if it should be attacked (by an unnamed force) or the government's level of preparedness for the appearance of any 'green little men' may seem like paranoid thinking to some, though it may have some merit to it after all. One prominent popular nationalist online news site, that said parts of Belarus were 'gifts' from Russia, has apparently garnered the favour of the authorities in Moscow, and may be under its protection, a development that warrants further suspicion. Belarusian rapprochement with the West – The recent thaw in relations between Belarus and the EU and US is a welcome development by most parties, though it may just amount to little more than Lukashenka trying to better his position at the bargaining table with Russia. According to the Washington Post, with the country's small opposition divided as to what to do in the face of potential Russian aggression, a Russian-dependent Belarus is unlikely to undergo any significant change. China Makes Its Move – A recent visit by the Chinese President Xi Jinping may signal a shift for Belarus' isolated economy. According to AP, the Chinese President signed nearly 20 agreements with his Belarusian counterpart to the tune of roughly $15.7bn, including a $700m loan. A contract with China for potash is one of the most prominent agreements made, though the exact terms of the deal are unknown. The Chinese president said of the improved ties that it was China's hope to make Belarus a hub for its 'silk road' development project, uniting Asian markets with European markets. Not Working? Then Pay For It – In an effort to combat making welfare payments to able-bodied individuals who are unemployed, the Belarusian parliament has passed a law that will require them to pay an tax. The law is based on a proposal made to parliament by Lukashenka and is designed to motivate people to get to work. The new law will not affect the elderly, disabled, or individuals with young children and is temporary in nature. AP reports that according to the Minister of Labour, the measure is a temporary one that is meant to incentivise individuals to find gainful employment and limit their burden on the state's coffers. Jailed Over A Tattoo – RFE/RL reports that Yury Rubtsou has been sentenced to another 2 years in jail, following his court date for violating a 18-month sentence of compulsory labour. His original sentence was handed down after he was arrested for wearing a 'Lukashenka, Get Out!' t-shirt — a phrase that he at some point got tattooed on his chest. During the course of his hearing, Rubtsou removed his shirt to show off his ink. He was originally brought into court for refusing to carry out his mandatory labour sentence and went on a 50 day hunger strike, complaining that wages were too low. UN Human Rights Council Decries Belarusian Reality – Members listed their concerns about the situation in Belarus at a session of the United Nations Human Rights Council in Geneva. RFE/RL reports that during the session, the US Ambassador to the council called on Belarus to reforms its electoral laws in line with OSCE standards, to which the Belarusian representative stated all had been done to make sure the elections would take place in an orderly and transparent fashion. The representative Swiss pushed for change with regard to how civil society organisations were treated, calling for their 'decriminalisation', while her Swedish counterpart called for the end of the death penalty in Belarus — the only European country which still employes it. Belarus' Lost Identity – Following the departure of Belarus' large Jewish population, little remains to suggest that it was once the centre of a vibrant community out of which world-reknown artists like Marc Chagall emerged. After the 1918 Russian Revolution and, later, the Nazi invasion of the region, the Jewish community in Vitebsk,Belarus has virtually been erased from global memory, save for a few classic paintings by Chagall. As the NYTimes piece suggests, after Chagall and his works were either ignored or defamed by the Soviet authorities, his presence and importance is finally beginning to be acknowledged again, as his love for the city emerges in the minds of Belarusians.